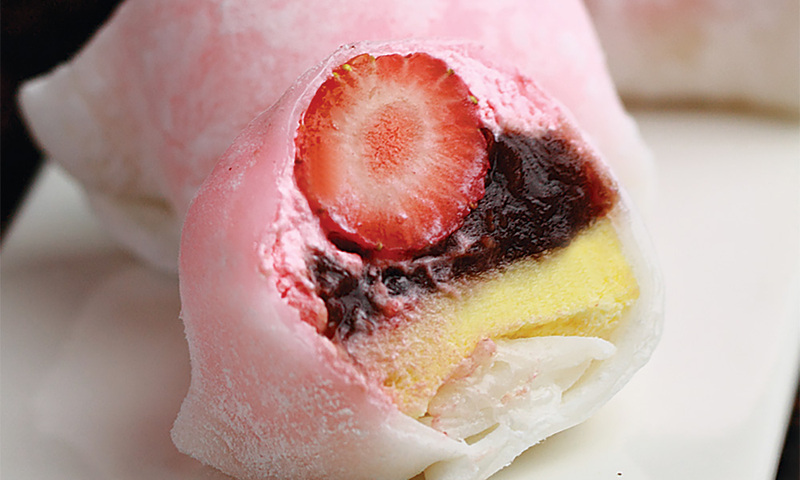 Daifukumochi, or Daifuku, is a Japanese confection consisting of a small round mochi stuffed with sweet red bean paste and seasonal strawberries. We showcase an upgraded version here where in each mochi, we have included a thin layer of buttery sponge and strawberry buttercream for extra creaminess. This recipe yields 5 medium sized Ichigo Daifuku. 1. Soak red beans with water for 5 hours. 2. Heat up a KENWOOD Cooking Chef to 110 degrees Celsius. Boil the red beans with 2L of water for 30 minutes. Discard the water. Put the red beans back to the KENWOOD Cooking Chef and fill in with 2L water, cook for another 40 minutes until soft. Blend the red beans to paste and put the red bean paste back into the KENWOOD Cooking Chef. 3. Add in brown sugar and butter, attach with a flexible beater, cook the paste for another 20 minutes or until dries up. 4. Press the red bean paste through a fine mesh sieve to smoother texture, keep aside. (The recipe should yield around 200 gram of anko paste). 1. Boil strawberry with water and sugar until soft. Keep cooking until reduced to syrup and mushy. Use a fork to mash it up and keep aside until ready to use. 1. In a KENWOOD Chef Sense, attach with a K paddle, beat butter at medium speed until softened, add in caster sugar and keep beating. 2. Once the buttercream becomes white and fluffy, add in strawberry fillings and beat at high speed until combined. Fill the cream into a piping bag and keep aside at room temperature to assemble. 1. In a KENWOOD Cooking Chef, fix temperature to 100 degrees Celsius. Add in glutinous rice flour, water and sugar. Cook until thickened. Around 15 minutes. 2. Immediately transfer the glutinous rice dough into a bowl and place in on a steamer basket and steam in the Cooking Chef for roughly 30 minutes. Once done, roll the dough into a log with tapioca flour as dusting, divide to 5 – 6 smaller dough each weighing 22 gram. 1. Line the bottom of a 2-inch ring cutter with butter sponge. 2. Fill the ring cutter with anko paste, lightly press to level. 3. Lightly press in strawberry, the strawberry should sink in half way into the anko paste. 4. Unmould, and pipe with strawberry cream, to cover the exposed strawberry. Keep in chiller until buttercream hardens. 5. 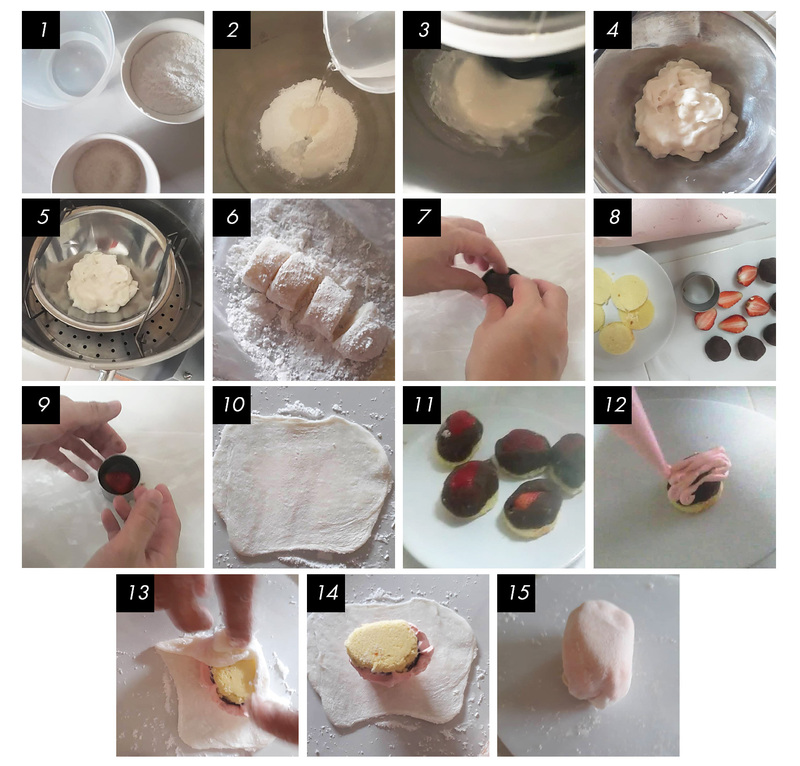 Flatten the mochi dough with a roller pin, place the chilled strawberry cream on the flatten dough (buttercream side faces down), then lift the mochi skin from all directions to enclose the mochi. You may need to trim off excess skin. Brush off excess dusting flour. 6. Keep in chiller for 2 hours before serving.